3 season rooms are awesome! 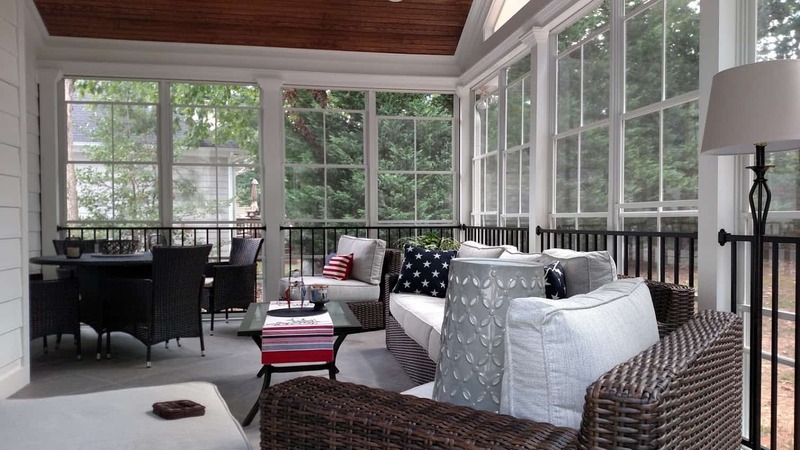 Eze Breeze panels are added to our gorgeous screen porches to seal them in from weather, pollen, even the cold! 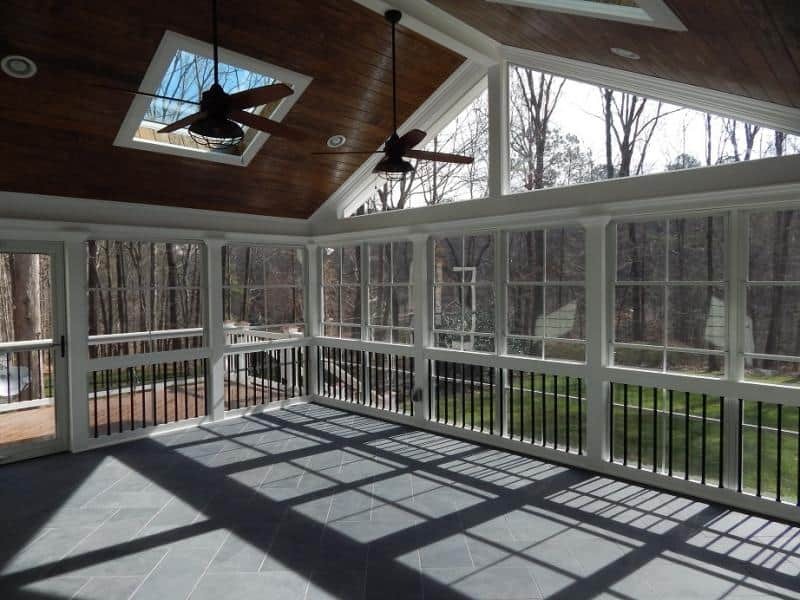 Eze Breeze panels are the easiest, most cost-effective solution to sealing in porches. 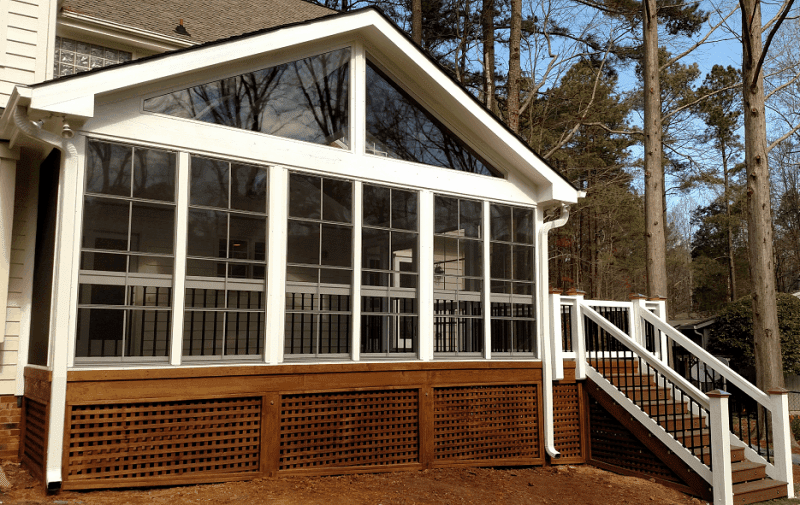 Each Eze-Breeze unit has four sliding, clear vinyl panels that slide up or down behind a screened outer panel (see video). When completely open you have 75% screened openings. When they’re closed, you have 100% protection from wind, pollen, and weather. They also hold in heat! 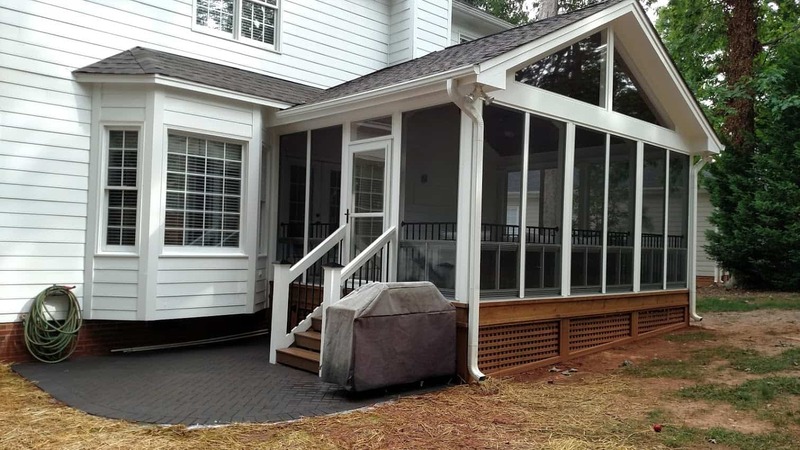 It only takes about 3 minutes to completely open or close the entire porch. There are many options you can have. See our options page to see what’s included and what’s available. 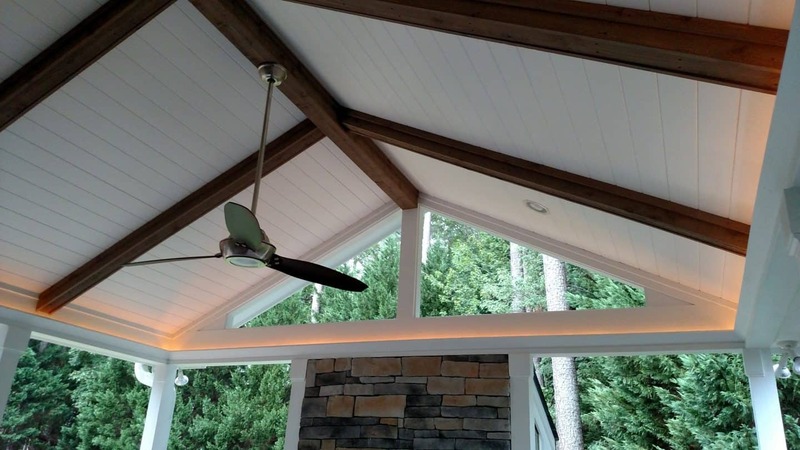 This 3 season room features my “Neo-Rustique” ceiling trim out. It’s been a huge hit as it’s truly unique, balancing just the right amount of classy and “beach rustic”. Notice the crowned posts, which we introduced last year. 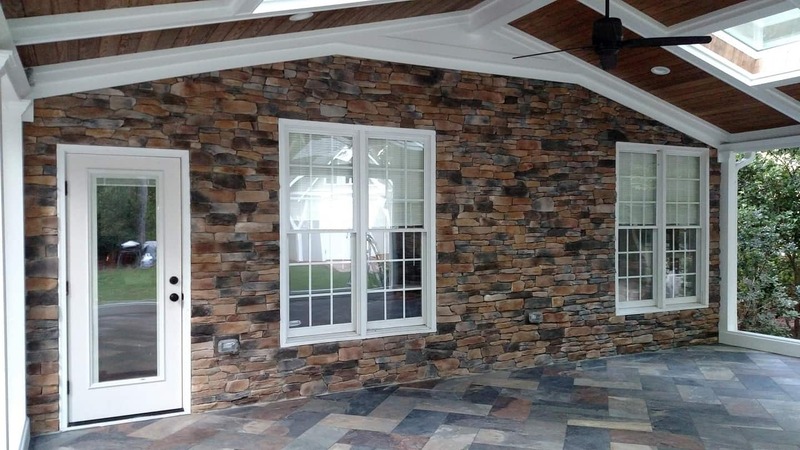 Not to mention our innovative privacy wall option. This option adds a place for a t.v and heater. 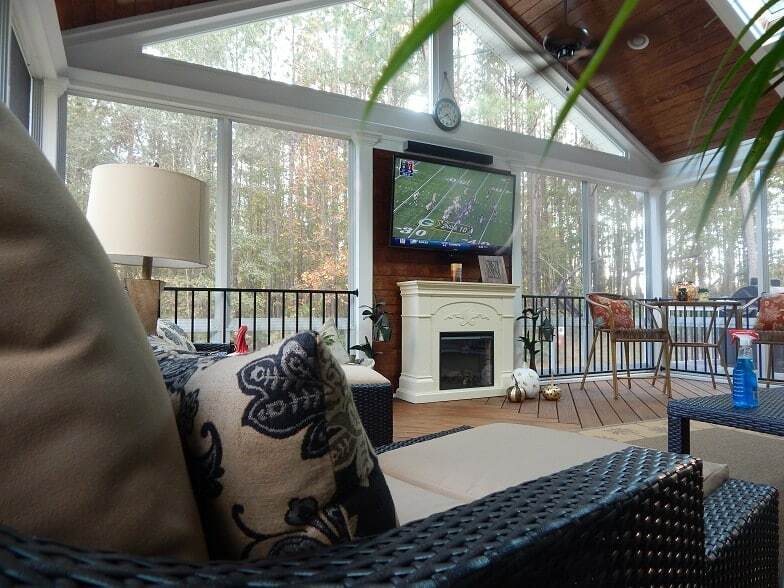 This orientation allows you to face the backyard view while watching t.v. and not have to face the house. 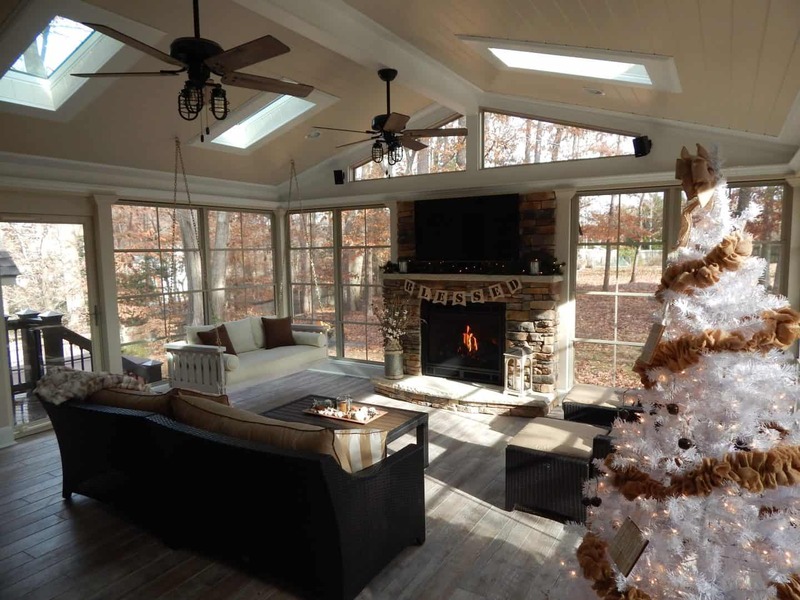 This 3 season room also features Eze Breeze panels, additional outlets with dedicated circuit for an electric fireplace heater, composite side deck, t.v. mount / cable / receptacle and, of course, all of our base package features! At 16′ x 22′, it’s a very comfortable size for furniture placement. 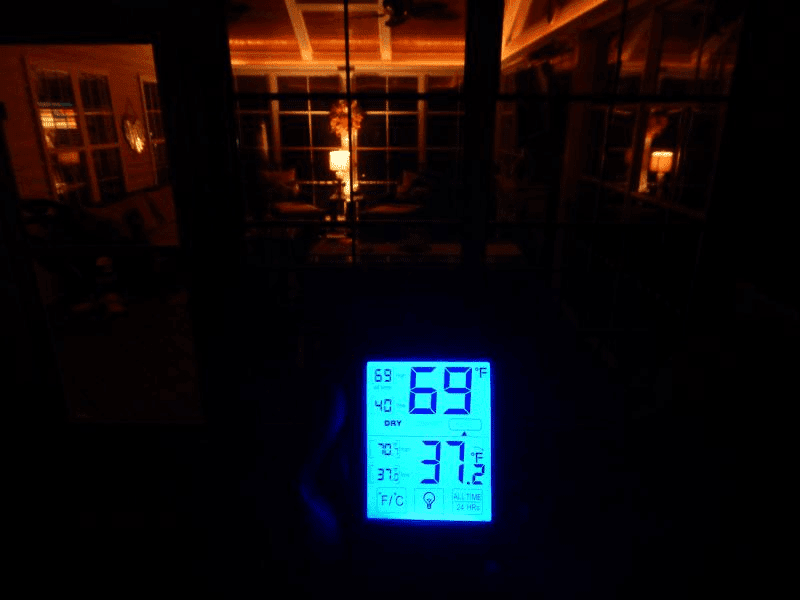 And check this out, on this cold night, it’s 37 degrees outside and holding at 70 degrees inside with little effort from electric heating! This 3 season room is dubbed “the Massive 3SR”! 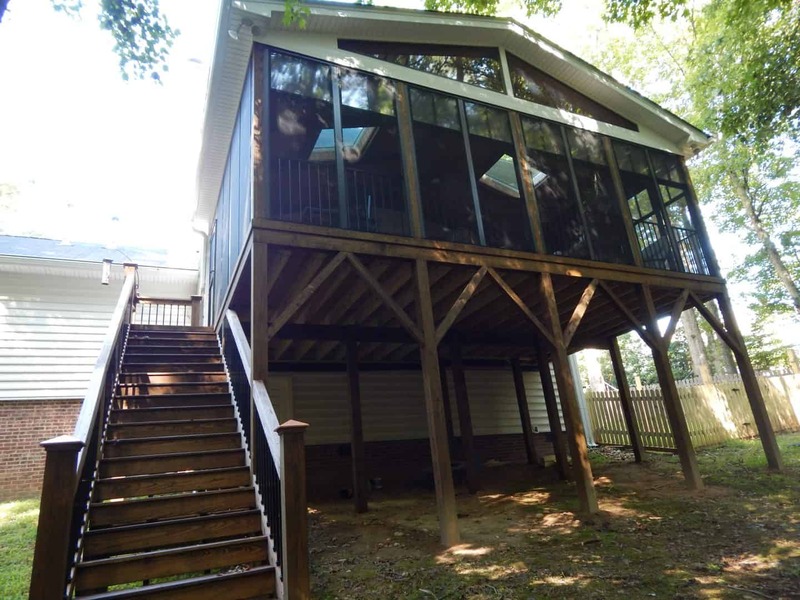 It is 20′ x 26′ and has every option you imagine! 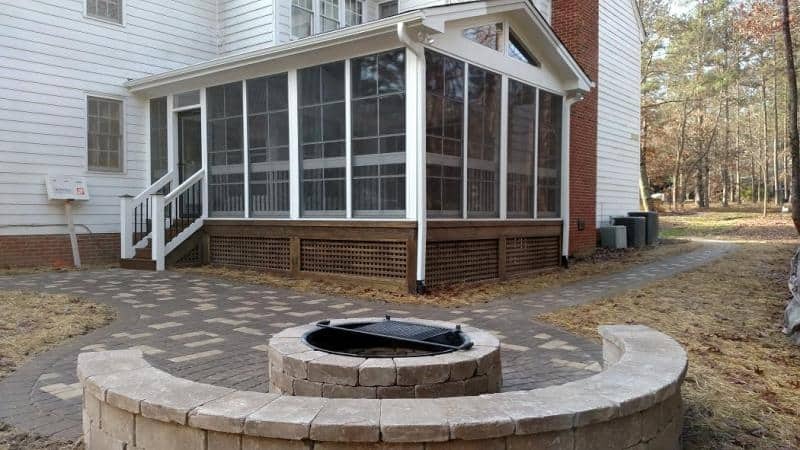 Tile floors, Eze Breeze panels, stone back wall, stone / gas fireplace, composite grilling deck, 4 skylights, 6 can lights, 5 outlets, 2 ceiling fans, new door install… This one’s so big, it’s hard to fit in the pictures! 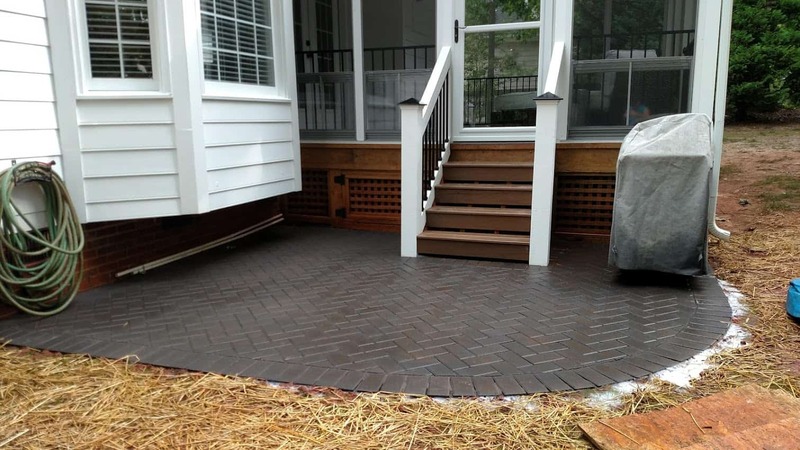 This is another “Super porch”. These are 3 season rooms with just about all of the options and of large size. 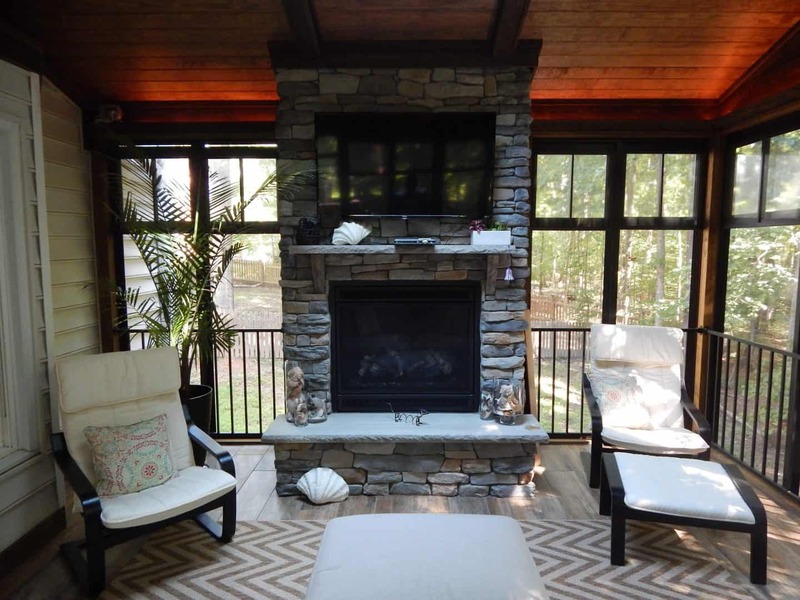 This one is 20′ x 20′, has a spectacular stone fireplace with curved hearth, 4 skylights, tile floor, outdoor patio, integrated surround sound system for t.v., Eze Breeze panels and more! 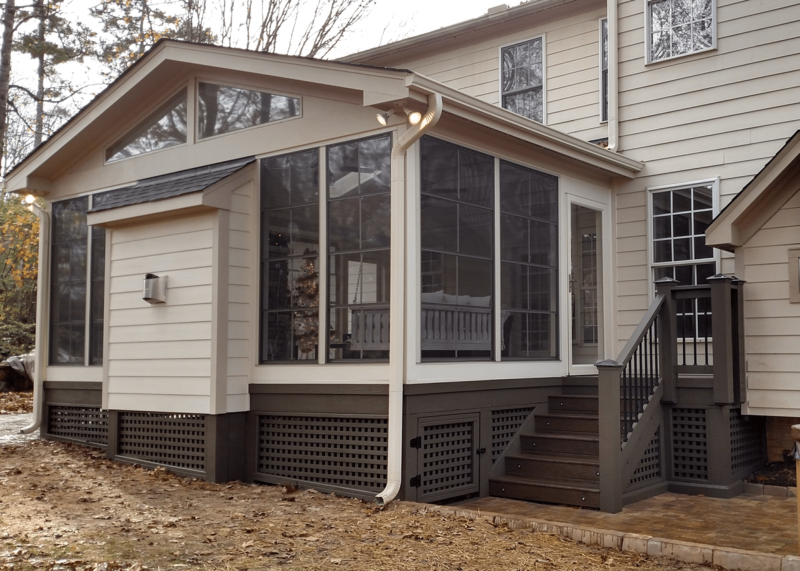 We worked out a color scheme to match the house with just the right amount of white but not too much. Color schemes are definitely one of our many strong-suits! 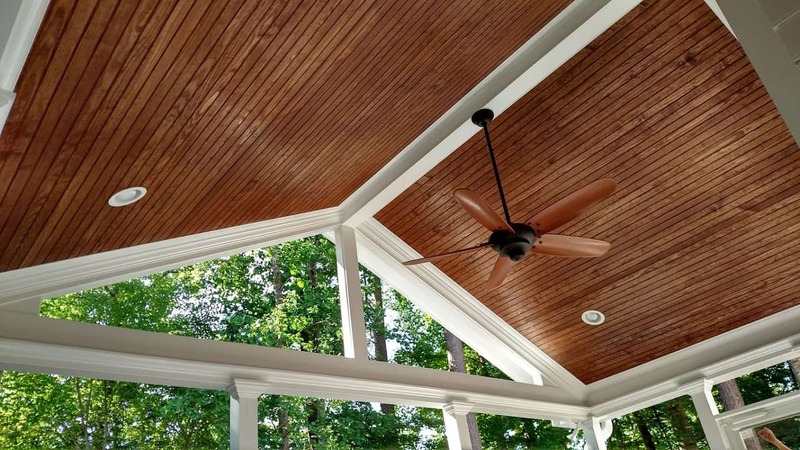 Contrary to popular belief, you can have a painted ceiling with no problem. 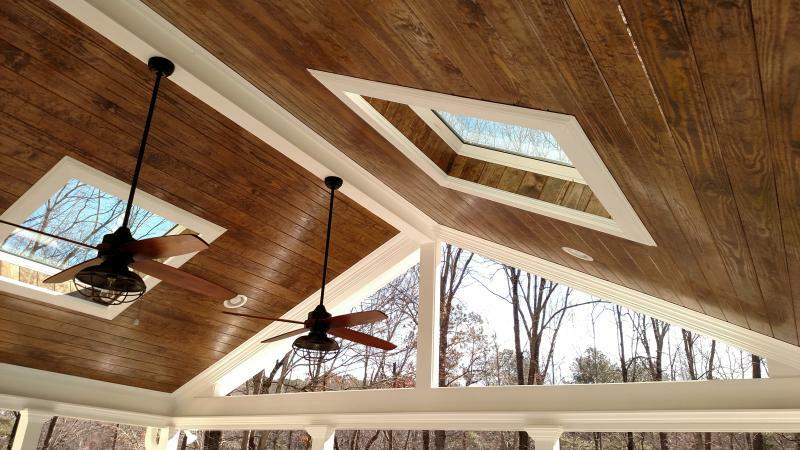 (see painted ceiling / colors blog). 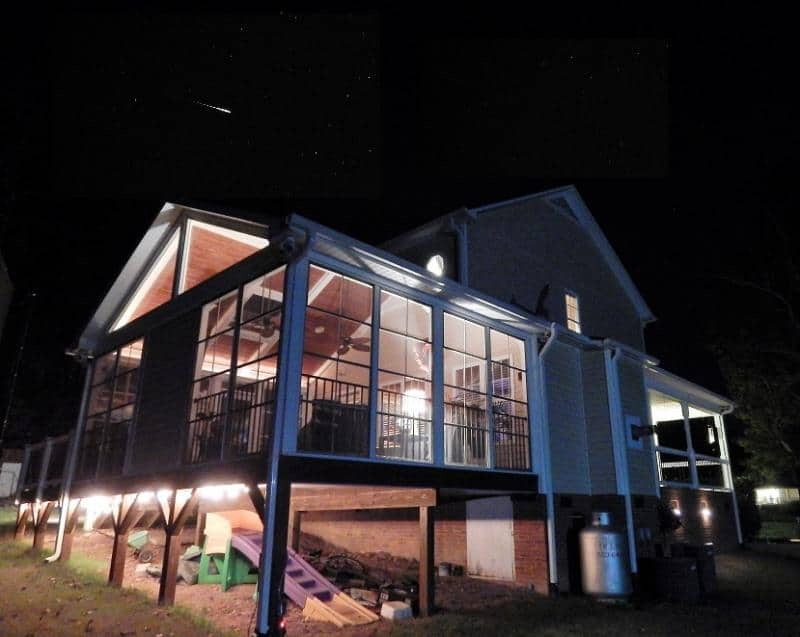 This is one of our more recent projects. 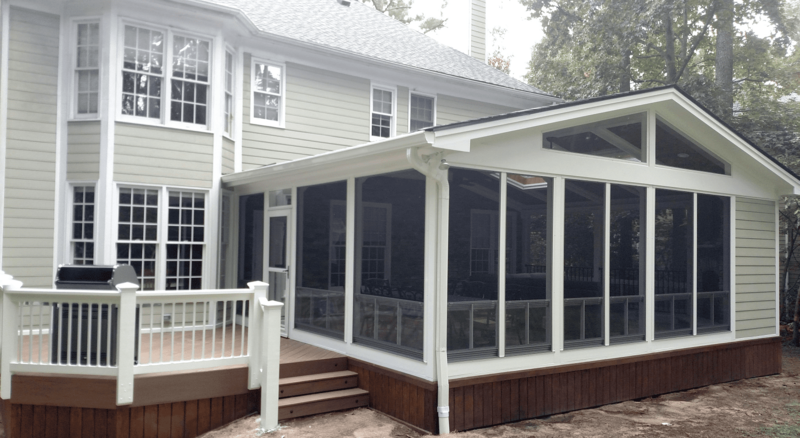 It features our standard ceiling trim out, tile floor, a composite grilling deck, Eze Breeze panels, 2 ceiling fans, and all of our base package options. Notice the crowned posts. I love this detail! 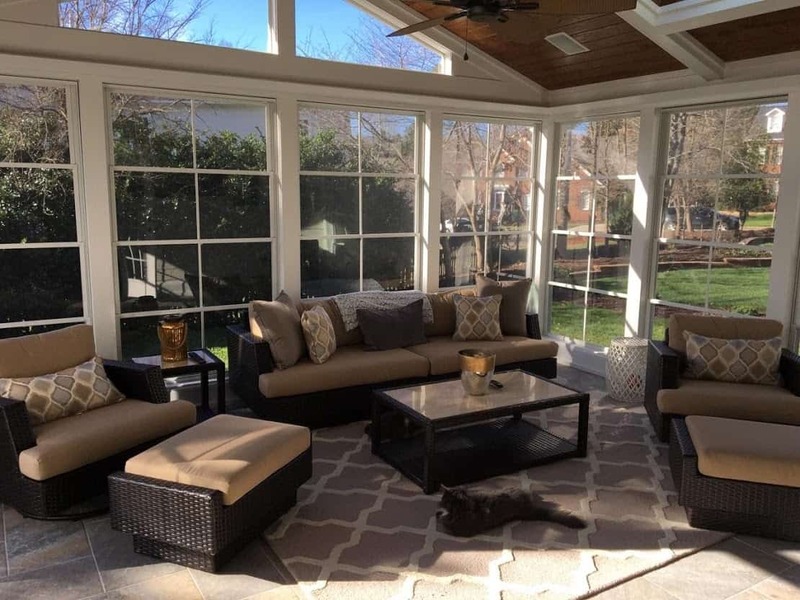 Contrary to popular belief, you can still do “window treatments” with the crown. 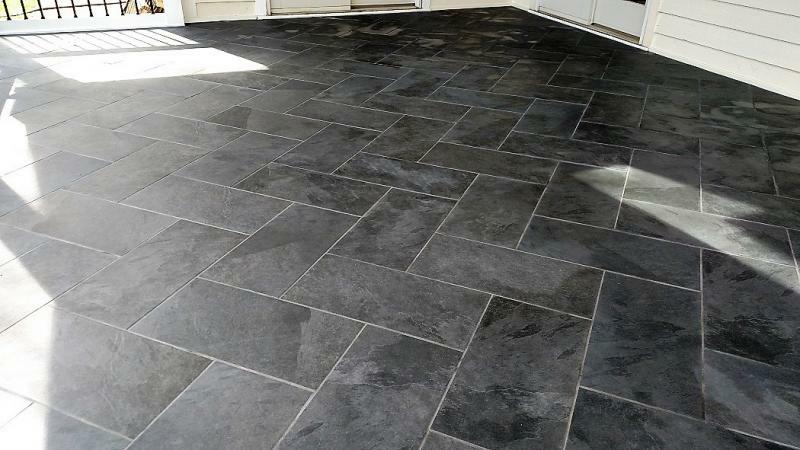 The tile floor is slate, laid in a herringbone pattern. 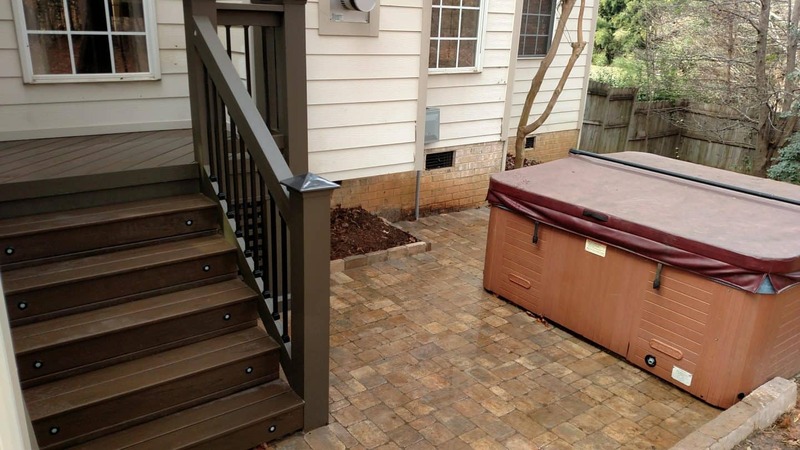 The side deck includes the best composite decking available installed with hidden fasteners for a sleek look. This one has it all! 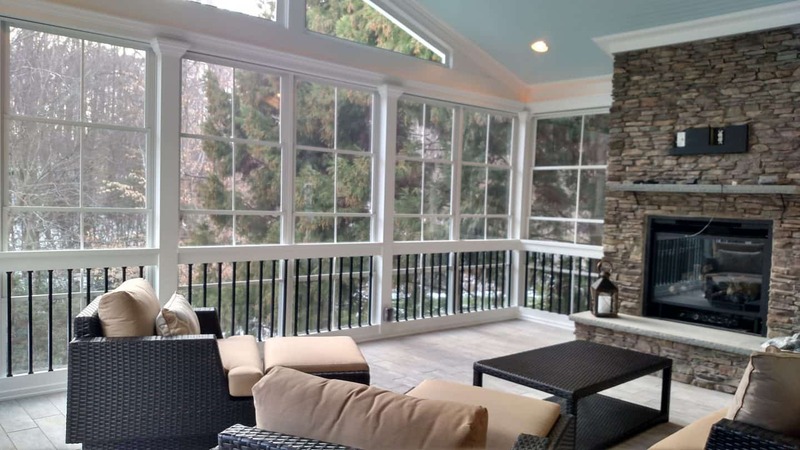 Eze Breeze panels, gas fireplace, tile floor, composite open deck / steps… Not to mention an “over-the-top” view of a stunning patio. 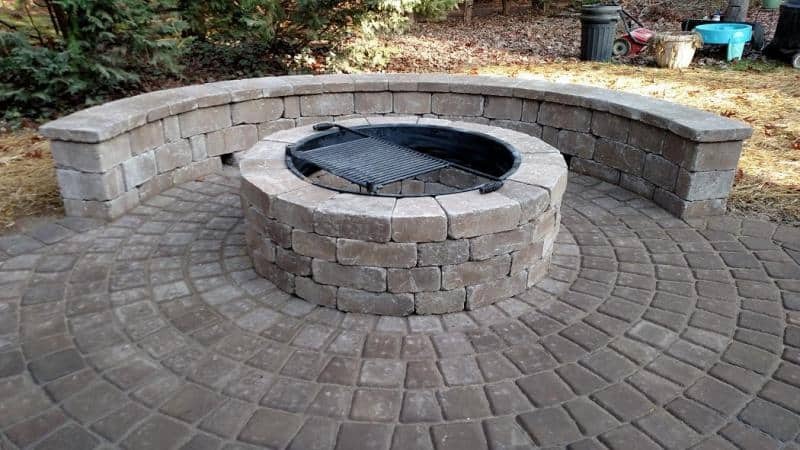 This custom patio features a fire-pit with a curved bench sitting area! 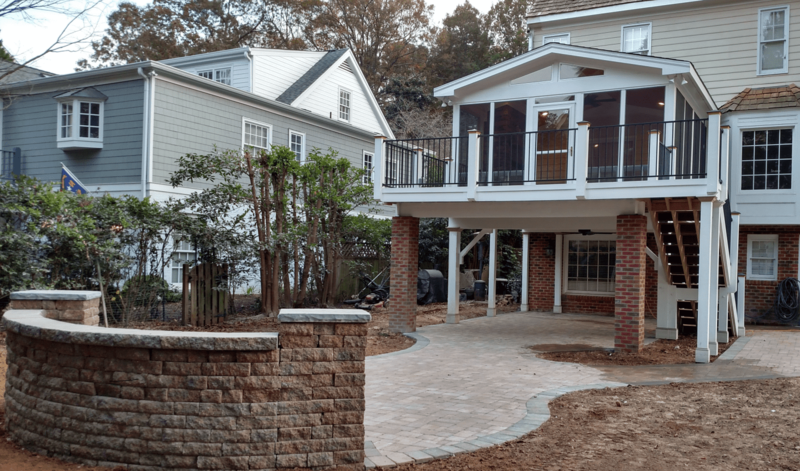 The entire project was designed to flow from one area to the next, while keeping main access points open and close to the main house. 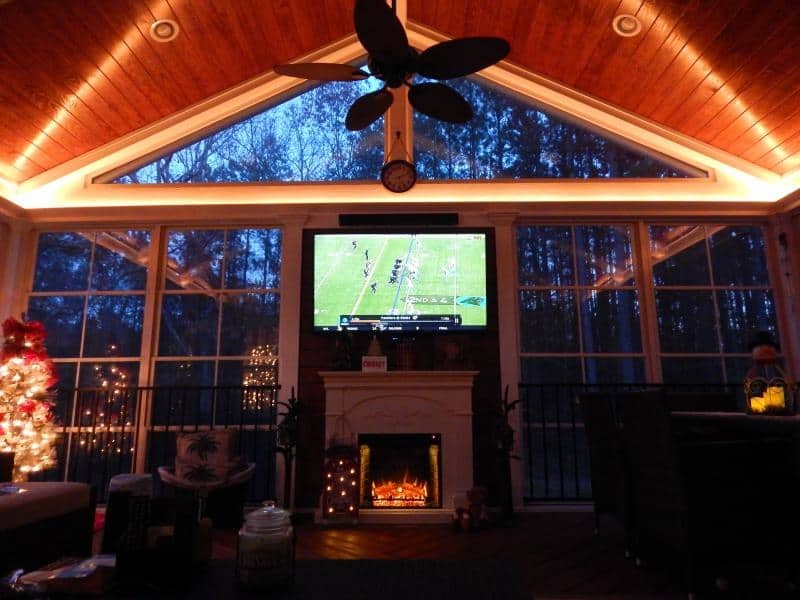 What a place to entertain! 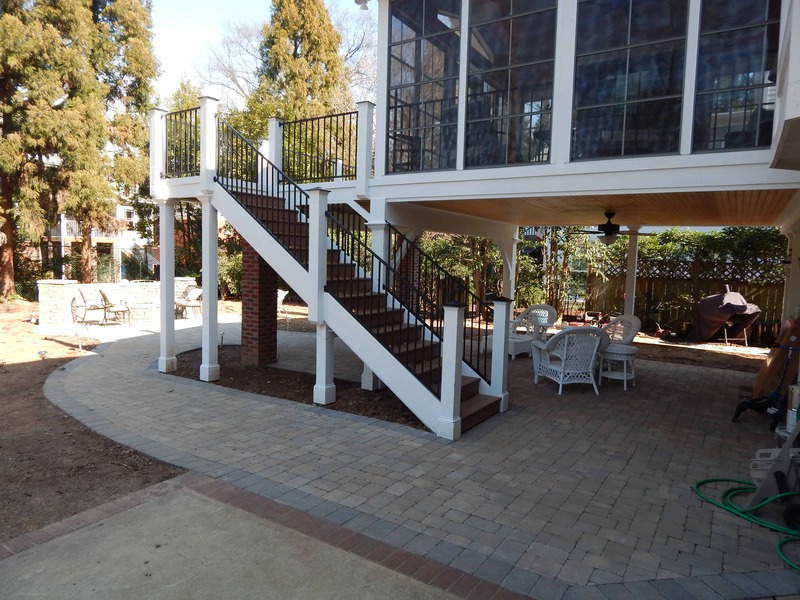 This project was built in the historic area of downtown Raleigh. OMG this one is awesome! I call this one “Morning masterpiece”. 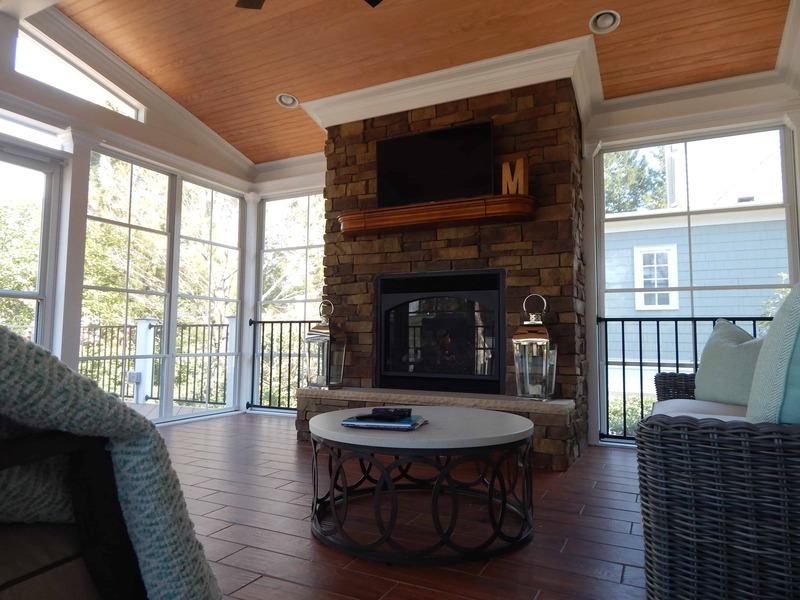 Here we have a 3 Season room with tile, fireplace, composite side deck and more… What a place to relax and have your morning coffee! 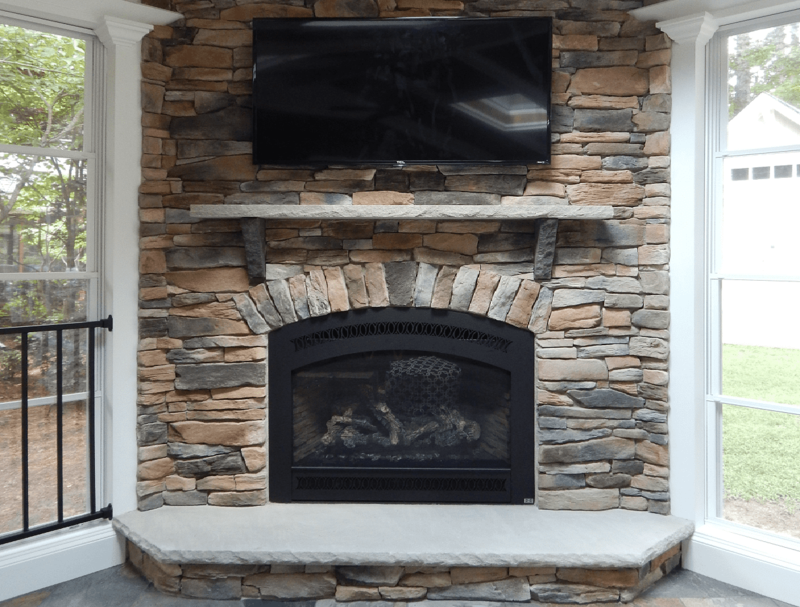 Check out the way we cantilevered the fireplace to maximize space in the room. This is yet another Pro-Built innovation from way back. The ceiling is a 3rd option in the rustic family. It is basically the reverse of the Neo-Rustique (which is stained tongue and groove and painted trim). I hereby name it, “the Reverse Neo-Rustique”! 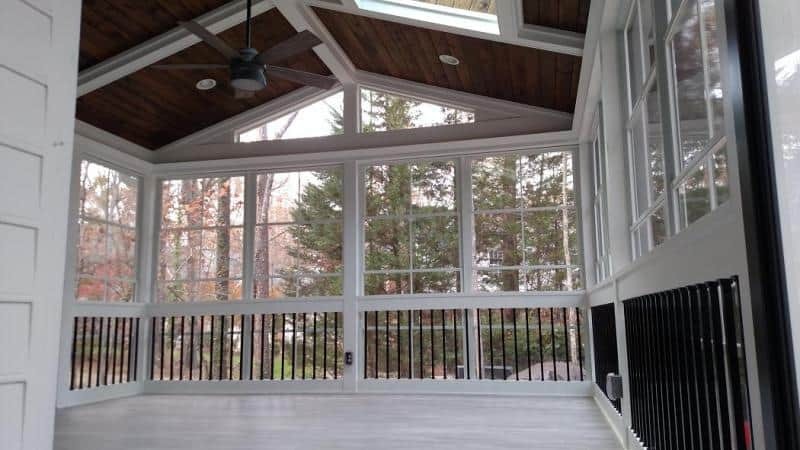 This 16′ x 20′ three season room is unique! 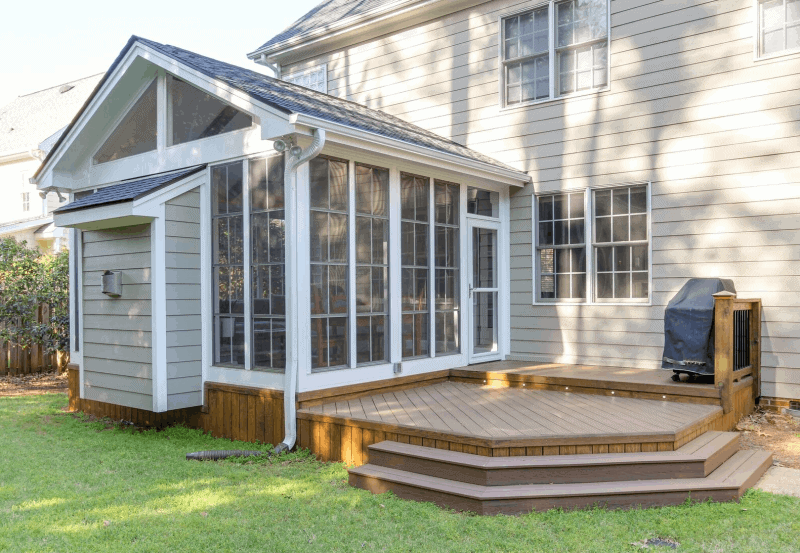 It features Eze Breeze panels that go all the way to the floor with no obstructions. 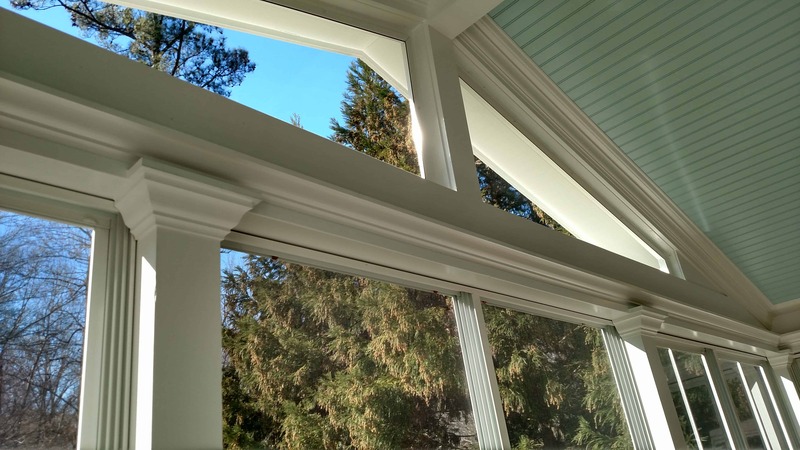 Our baseboard “toe kick” runs around the perimeter of the room giving the look of a sun-room. 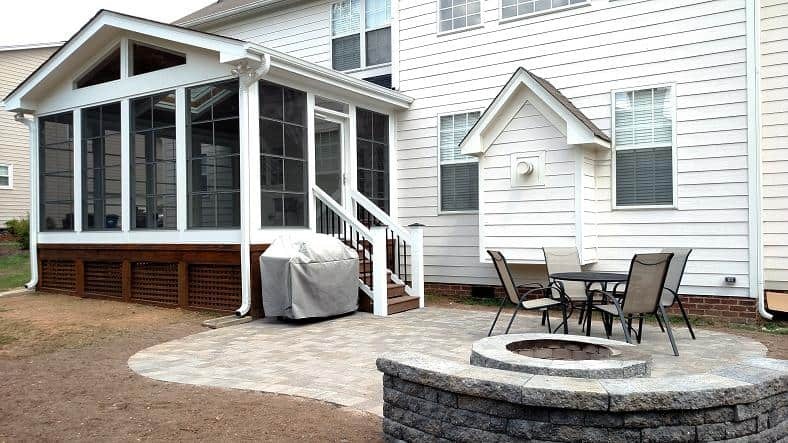 This one also features tile floors, composite steps, and an outdoor patio with fire pit with stone sitting wall. 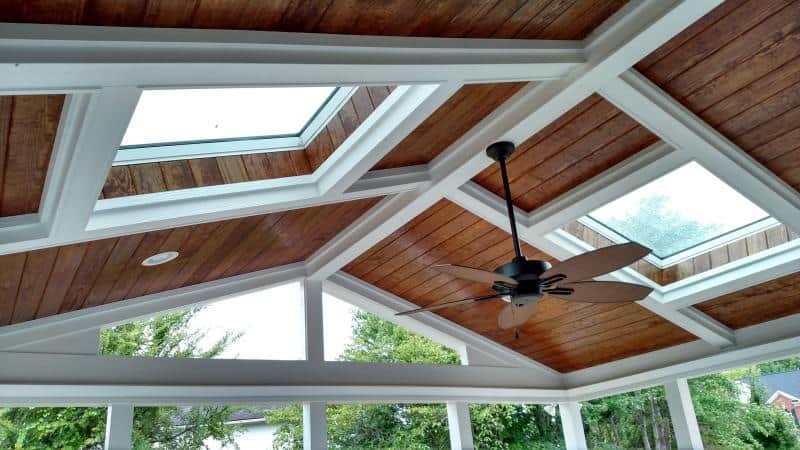 Another Neo-Rustique ceiling trim out. 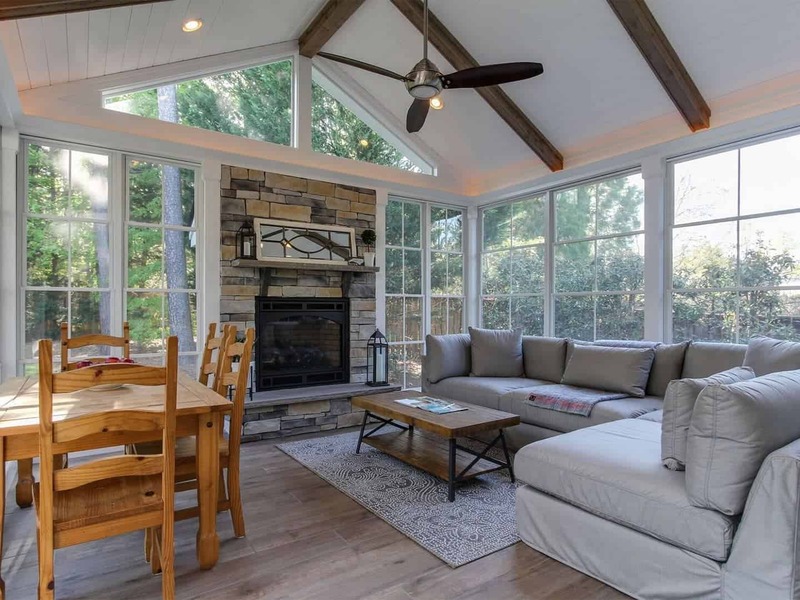 This 3 season room has a gorgeouzzzz tile floor and a killer patio with a fire pit. 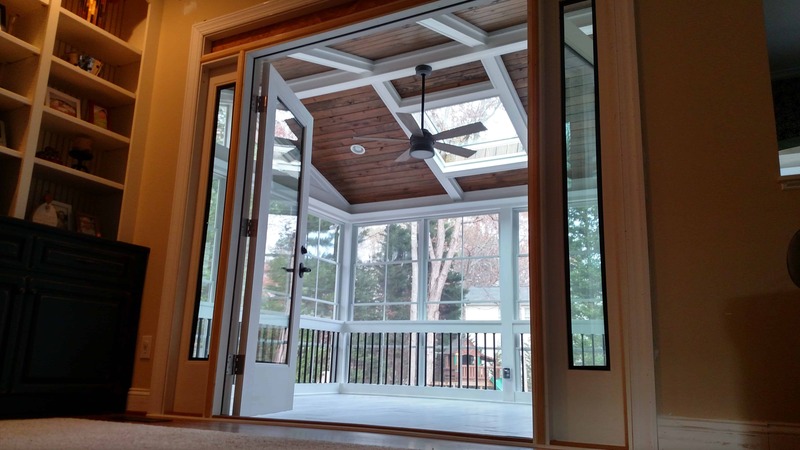 We also installed new french doors to open out onto the porch. 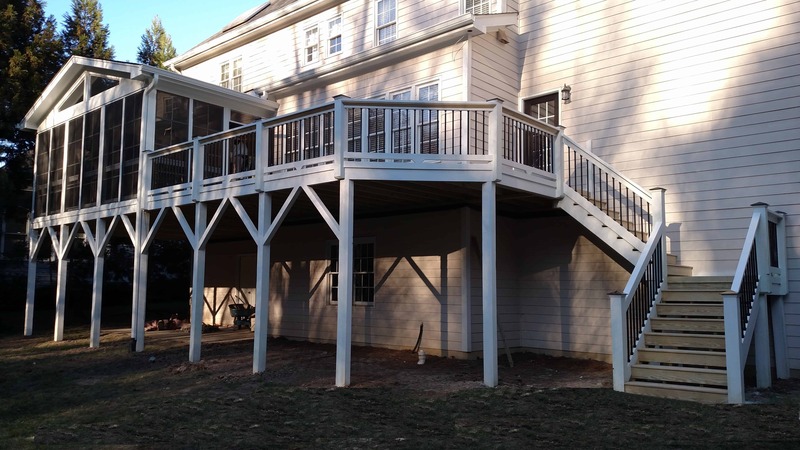 As shown here, some people prefer to have us install our normal porch railing on 3 season rooms, which is no problem. Another one of our rustic designs! 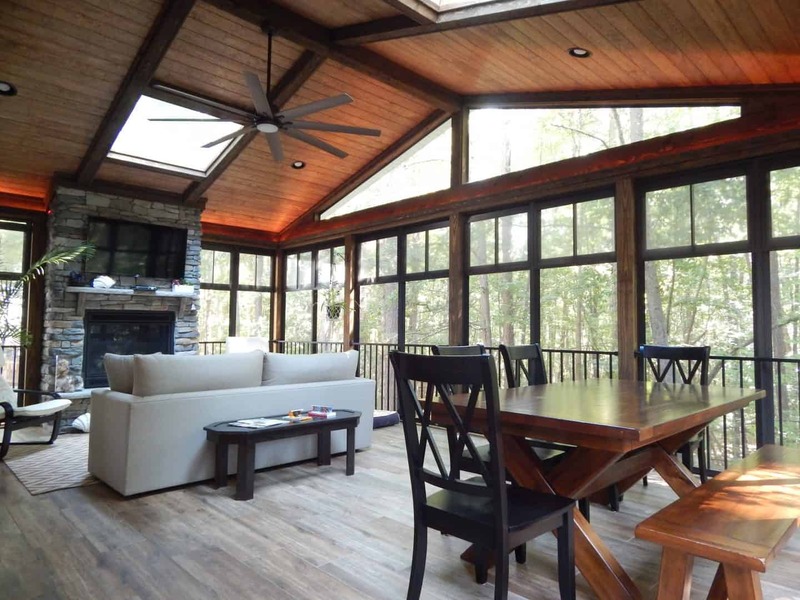 This 3 season room has the full mountain cabin experience. 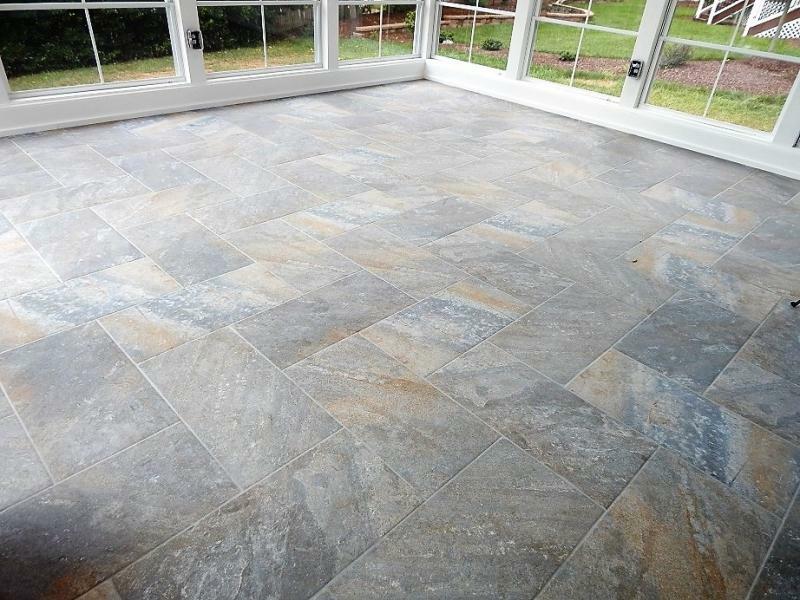 A rough stone fireplace with a beautiful rustic tile floor complete the feel! 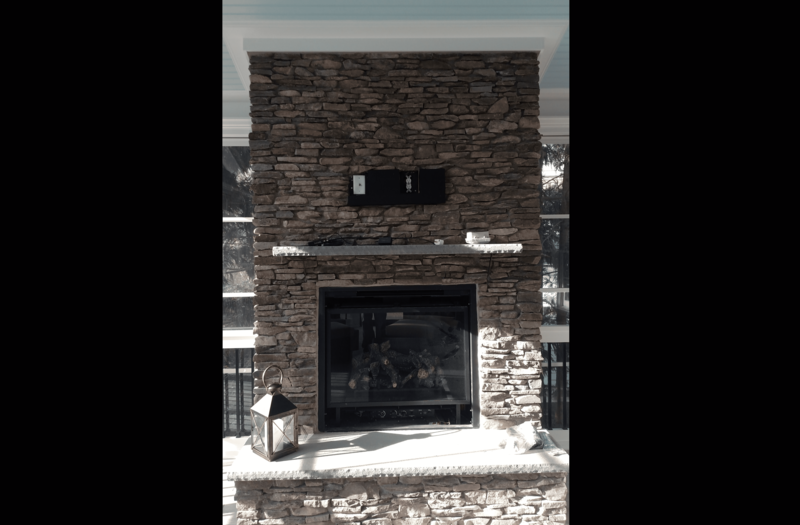 This is another Super 3SR, weighing in at 16′ x 26′! Another monster sized 3 season room, this one has all that you’d want in a 3SR! 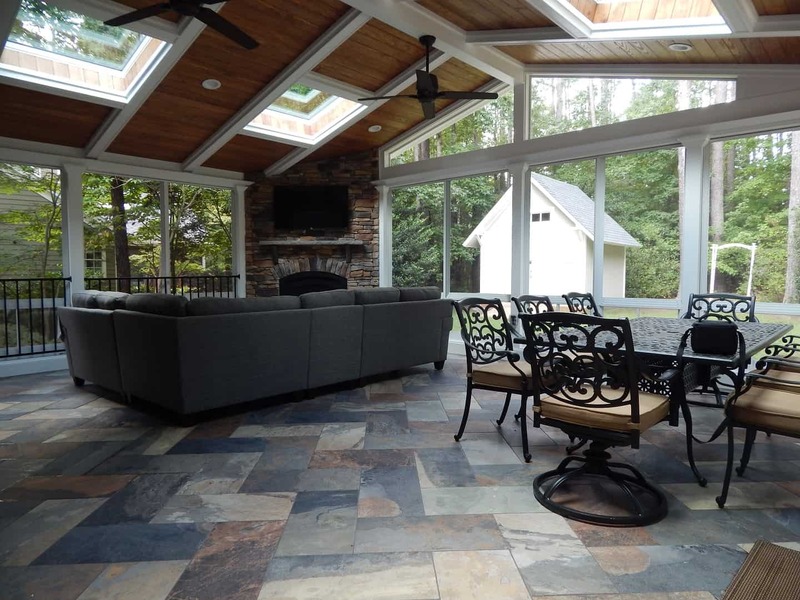 Tile floor, fireplace and a large open side deck! 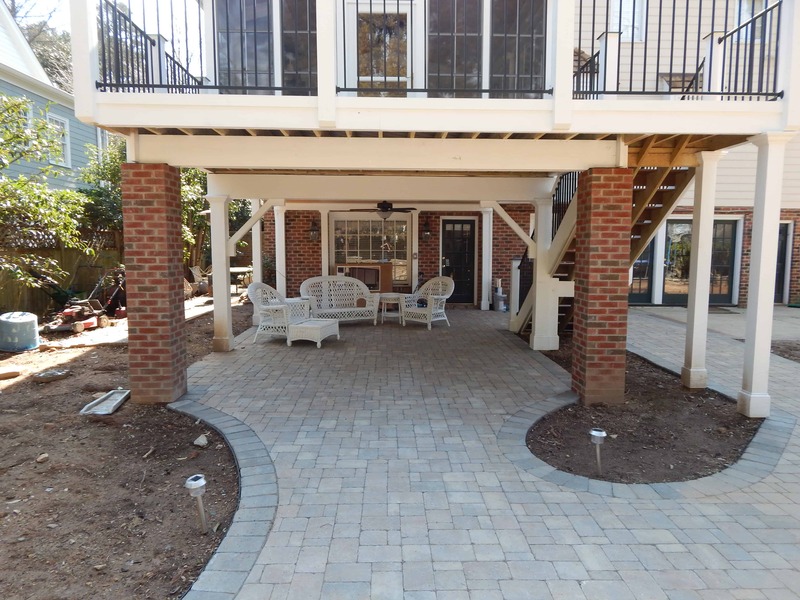 Here we have a base package porch with three upgrades: Eze Breeze panels, tile floor and a paver patio. 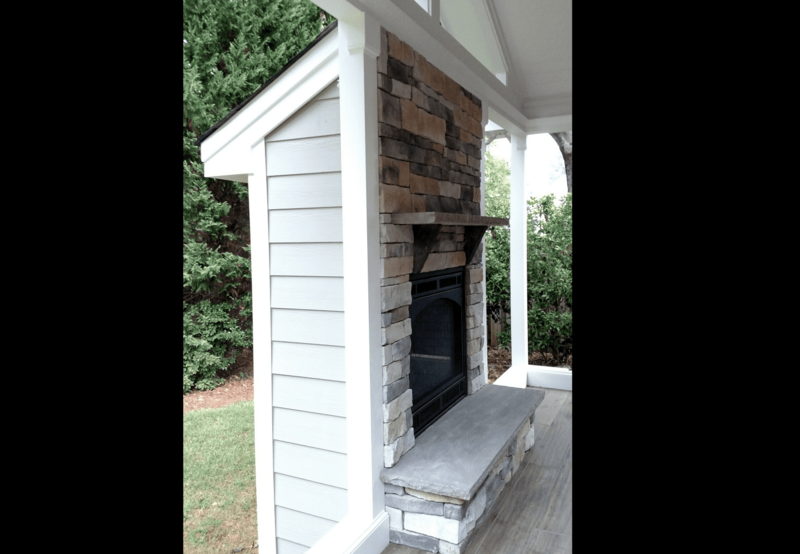 The dimensions are 14′ x 20′. 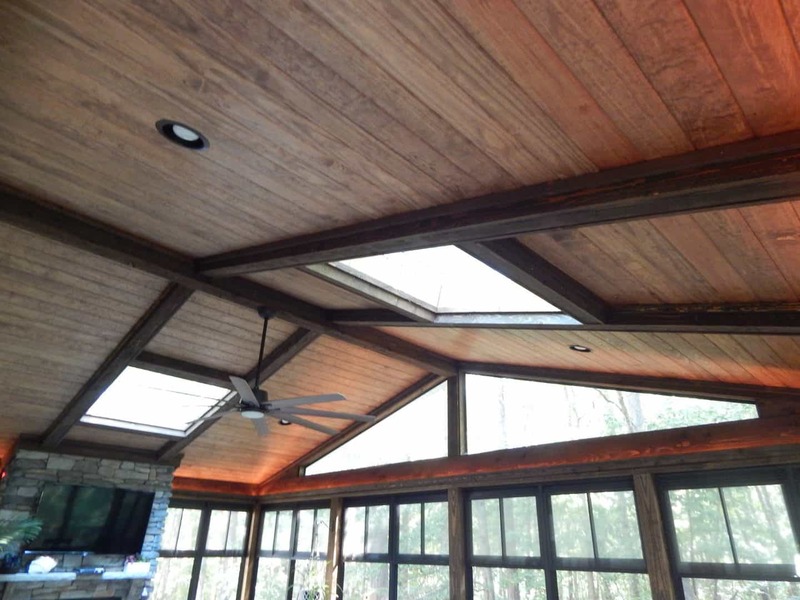 The ceiling is our standard trim out, finished with English Chestnut stain.